In part one of our SEO for content creators bundle we make the setup for SEO training while part two focuses on the core HTML skills you must have to take these courses. 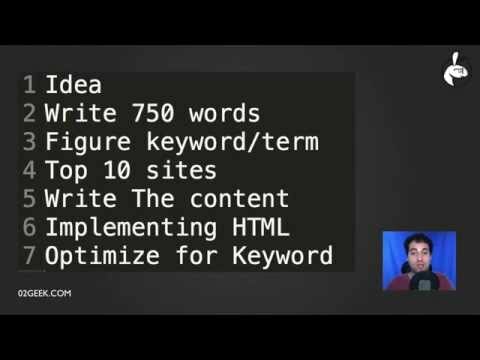 In this part we will walk you through the tools we use to optimize and create better pages that work better and help us to optimize our content for SEO. In this day and age doing SEO isn't as simple as just going and doing it. We need to leverage the power of some tools. In the next few videos we will introduce the basics of the tools we work with some of them are free tools while other are paid tools. One of the more critical steps of doing any SEO work is knowing how well your are doing and monitoring the keywords you are tracking. The main goal of the tool is to simplify the process of monitoring your ranking progress. It helps motivate you but more over then that it helps you protect yourself by helping you if there are major changes for good or bad in your efforts. The main tool we will be working with throughout this course is Website auditor its the one we use and the one we leverage throughout our training as we dive deeper into changing and optimizing our content for search engines. Keywords is in the heart of search. Unfortently you need to log in before you can use the keyword tool as it's been updated since we last made this course. It is still valueable but a lot less as now google can know what your searching for and save that information and that's never something we like doing. i would recomend just trying to use the general search bar and finding suggestions that way. We will be using google Analytics to track our progress and know how our overall results are doing (above our actual search results). AS we will start capturing new traffic that is organic as our pages get more filled up and we have more pages on our site. Although these days FireFox isn't the most popular web browser on the web it is our favorite as it has such a great amount of tools that help us improve our site. Don't forget to install web developer and firebug as we are going to assume from the next segment that you have all these tools installed on your end.